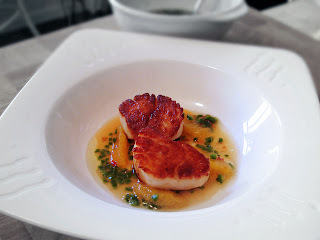 F or someone that doesn't eat a lot of spicy food, this video recipe for Seared Scallops with Orange and Jalapeno Dressing may seem pretty intimidating. Along with the orange "supremes," a very healthy amount of diced jalapenos form the base of this great appetizer. Jalapenos are not a super spicy variety of pepper, especially if they are prepped the way I demo here. We want the pleasant bitter-sweet heat of the fruit, but not that burning sensation that many associate with jalapeno. Those sliced peppers you had on the nachos were unpleasantly hot because they retained the seeds and white membranes that contain all the capsicum (the substance that gives peppers their fire). By the way, this does make a great excuse for why you drank so much beer. If you use the technique I show in the video, you will be amazed at how mild, and great tasting jalapenos can be. Once cut correctly, in a "Brunoise" as I joke about during the recipe, the peppers make a perfect partner to the sweet orange and crusty seared scallops. This would make a very cool first course for those upcoming holiday parties, but make sure you watch the searing technique carefully. A very hot, very good quality pan is critical, as are dry, wild day boat scallops. If the scallops are wet, and/or the pan is not hot enough, you will get the dreaded "boiled" scallop – a pale, shriveled knot of disappointment. Done properly however, this is one fantastic seafood recipe. Time and money allowing, maybe even practice before the big day. Enjoy! Just curious how you come up with these interesting flavor combinations? orange and jalapeno is a very common combo, and often used for seafood, so I can't take credit for that. While I love oranges, I'm not a fan of orange flavor in food, but I might have to give this a try. Also, scallops are my VERY favorite food in the whole world! 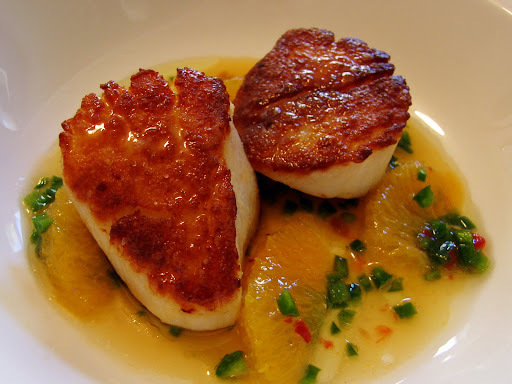 There are, unfortunately, many of us (who perhaps may live in a small town with only one grocery store who consider themselves fortunate to find any fresh scallops at at all, ever, ahem) who do not have access to the dry scallops you speak of. It just so happens Cook's Illustrated tackled this issue with their usual exhaustive research in the current issue. Unfortunately, it is 'premium content,' so not available on the website, but it calls for kind of butter poaching the scallops to achieve the same flavor and tenderness. I suppose the butter would take the place of the olive oil, then. What would you think of this substitution? butter poaching is nice for seafood, but unfortunately you don't get the seared crust. as long as you carefully thaw and dry on towels, it should still work. BEAUTIFUL Sear, must've been an delicious explosion. Hi there! I'm new to your blog! I stumbled onto your farmer's cheese video and am a new fan. Lovely video. This looks gorgeous. I look forward to trying it. You mention that your rice vinegar was flavored a bit? Do you mind elaborating on that? It doesn't sound critical to the dressing you put together here, is it? thanks, there is seasoned rice vin which has a little salt ans sugar in it, and plain. I use seasoned usually. I guess I wasn't clear: the CI recipe IS for crispy, pan-seared scallops. It starts with a short brine (to counteract the taste/texture of the 'wet' scallop), begins in olive oil, and is finished in a short butter bath/poaching. Not a lot of oil or butter is involved either way. They also give several recipes for sauces to accompany them, not one like yours, but they also sound pretty delicious. Your dishes are awesome and I am really enjoying trying them when I get the chance to get in the kitchen. Just wondering if you﻿ can suggest a substitute for the jalapeno. My poor husband is allergic to any chilli - but I would love him to try scallops for the first time with the orange dressing - looks really tasty! i'm afraid i don't know of a non-chile sub. u could try black pepper. Used the recipe as described with following exceptions. 1) Did not have sambal, added some red pepper flakes. 2) Rice vinegar: Marukan Sodium & Sugar free. 3) Large Sea Scallops - sort of gooey looking. 4) Could only find Navel Oranges. Rinsed and dried the scallops and tried to sear a trial scallop but it stuck to the cast iron skillet so I lightly dusted the remaining scallops with flour just before searing them as you described and they behaved just as yours did in the demo. Result beautiful, delicious scallops but sauce was not sweet. Later tasted "Seasoned" rice vinegar and found it to be sweet and salty, it definitely would have corrected the taste. I shall try it again this week. wow, sear of the year right there. that had to provide some next texture contrast. Great work and great photos. Chef John, well sir what can i say i stumbled upon you and your videos on youtube and i have to say sir i use them to practice daily. I am a Culinary Major and a diehard fan of yours i have a question regarding this very tasty and textured dish if i may sir. This is yes a great beginning course what would you recommend for a second, third and fourth (assuming i leave out a dessert or 5th course?) I really want to try this on my family for one of those sunday evening family dinners and wow them to death i would appreciate your assistance kind sir. If you already have recipes up on here just mention the course and the recipe and boom i will do the rest. Again thank you for the guidance and for the delicious education, much respect Chef from a hopefully future Chef. Here is my official Google addy Chef, thank you ever so much again for all of your help. Much respect. anon, don't mean to blow you off, but the next few days are insanely busy, and I would have no idea where to start planning a complete menu for your family. There are just so many choices and combinations and I don't know their tastes, etc. Just browse though the recipes and choose what you like and I'm sure they'll love it!! Chef John, I live in Seattle with pretty good access to fresh seafood. However, the scallops and shrimp we get are "IQF" which the seafood guy told me are "individually quick frozen." He told me they are better than dry packed, and there was no way to get them any other way. What's your feeling on IQF shellfish? sorry, don't have a lot of IQF info! I've used it many times and generally been pleased. IQF or block frozen, the main thing is whether or not they are packed in a solution containing a preservative (I believe it's trisodium phosphate). That preservative is what makes the scallops soak up moisture so that they steam rather than sear when you cook them. The product I use comes in 5lb packaging and is "block" frozen. They're frozen at sea, have no preservatives and sear up perfectly. The "block" is in 4 sections, so you can break it up and thaw out a smaller portion to use. With IQF, you can just thaw out exactly however many you want. If you were in Alaska, I'd sell you some. Strangely, even though they are an Alaskan product, the company we buy them from is based in Seattle. I don't want to post the name, because it would look like I'm advertising for them, which I'm not. We buy from them. However, the first part of their name is a four letter word for what they call an exploding star. The other part of the name is seafood. Lol. I have no idea if they sell directly to the general public. Some foodservice places will, some won't. Oops. Correction on my last comment. The second word to add to my riddle was "Fish" not "Seafood." If you use "seafood," you get a supplier from the east coast, not Seattle. At this point, I might as well just say that we buy them from novafish.com. Again, I'm not sure if they'll sell to the general public. Hey Chef John, I would just like to say how amazing your videos are! I can't wait to try this recipe, but were should I go to get day boat scallops? Are they at a normal grocery store or are they at seafood markets? Thank! not sure, depends, I would call around first! Hey Chef John, I am in the process right now of preparing this dish and the jalapenos sauce mixture is amazing. Doubled the recipe because I added more than 4 scallops. My mouth is salivating because I can't wait until it's done. The pan is heating up. OMG, I will let you know what we think of this dish. Chef John, we just got through eating it and this dish was incredibly marvelous. I'm here to tell you, we LOVED, LOVED, LOVED it!! I've checked out other cooking websites over a period of time, but I keep going back to you because of the videos that are so informative and the way you present it. I'm learning so much from you. Thanks for all that you do, truly!! Just one quick question, is a non-stick pan okay for this? You can deglaze with a little water if you want. Any suggestions for a side dish to go with these scallops? Typically I would go with asparagus but not sure about asparagus standing up to the Asian flavors. Any thoughts? Thanks! Chef John, this is another amazing recipe! Decided to have the seared scallops as main dish. Sides included fresh green string beans, sautéed with olive oil, sea salt and splash of balsamic vinegar. And, creamy mashed potatoes pulled it all together. Thanks!!! My father-in-law and I both share a love of cooking, and he showed me your site earlier today. Saw this recipe and had everything for it at home other than the jalapenos. I stopped by the grocery store on the way home to grab some and tried this dish as a "date night" meal with my wife after the kiddos were in bed. I am HOOKED. Will definitely be trying more of your delicious food! My wife's favorite food is anything seafood with scallops being her favorite, so I'm always looking for new ways to cook them. Made this tonight as a main dish. I seared the scallops in coconut oil in my cast iron pan and put them on a bed of wilted spinach (seasoned with salt, coriander, and some orange zest I got before peeling the orange). She loved it. I didn't have enough scallops for both of us to have a main dish, so I did mine with a barrumundi filet I had in the freezer. That was amazing as well!